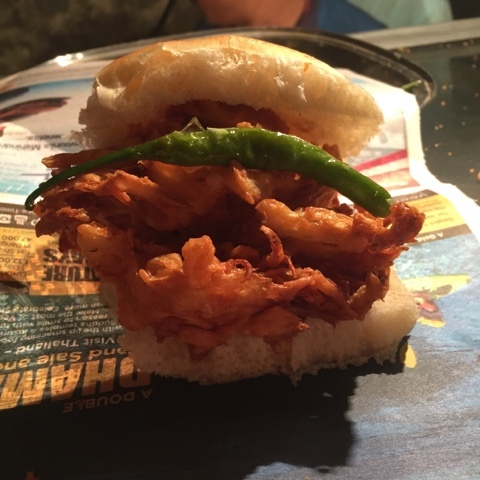 The Mumbai sandwich. Do you prefer it toasted or grilled? I still remember my first taste of the Mumbai toast sandwich. I had come to Mumbai from Kolkata during my MBA days to give placement brochures to offices here. In those days, most offices of note used to be at Fort, Churchgate and Nariman Point in South Mumbai. I am talking of 1996-97. One day I stopped in front of the Eros Cinema at Churchgate where a man was selling sandwiches toasted in a handheld toaster. He put in slices of vegetables - boiled potato, raw beetroot, onion, tomato and cucumber and put them in two slices of white bread, the bread was coated with green chutney inside and butter outside and he put this into a hand held toaster and placed the toaster on a little portable coal oven. He flipped the toaster around after a bit of time and then the sandwich was finally ready after at least 5 minutes. He opened the toaster. Took out the sandwich. Placed it on a plate. Smothered it on the top with butter, then ketchup and finally green chutney (ground coriander, green chillies, grated coconut and lime juice), cut the sandwich into bite sized cubes and served it. The sandwich was hot and one had to wait before eating it to avoid singeing one's mouth. I finally took a bite. I did a double take. The sandwich was hot, spicy, sweet, tangy and crunchy. This would be more than a decade before I heard of the cliche 'the flavours exploded in my mouth,' and yet, that's exactly what happened when I had my first toast sandwich. It was quite filling too. I was spellbound. I was in love. The handheld toaster reminded me of the toaster my granny had in Kolkata and in which she made me toasts when I visited her as a child. I returned to Kolkata once my work was done and then after a while moved back into Mumbai, this time for good. The Mumbai sandwich became my favourite street food dish here. The chatpata green chutney made it intrinsically Mumbaiyya for me. The butter the secret of its crunch that hypnotised me. In our courting days, my future wife and I would pick cheese chilli and alu toast from the sandwich-wala outside the Nirmal Building at Nariman Point where we both worked then. She would ask for an extra slice of boiled potato after we got our order just as we asked for a 'fau' free phuchka at the end of our phuchka binges back in Kokata. A few years later, Mr Gwalani, whom we called Uncle, would order a toast sandwich for me and an untoasted one for K, when we met him at Carter Road. Uncle is no more but we still remember him when we pass by the CCD at Carter's as the three of us used to sit adjacent to it. Give me these freshly made roadside sandwiches any day over the pre-packed and rather stale sandwiches that one gets at coffee shops which are way more expensive too. I am not romanticising street food here. I can objectively and confidently tell you that these 'Mumbai sandwiches' taste way nicer the coffee shop ones. I love the crunch of the toast sandwich while K prefers the soft un-toasted ones. We both choose the basic vegetable ones but you can also load them with cheese, ask for specific combos - only chilli cheese for eg - or have a 'masala toast' where the plain boiled potato slices are replaces by a spicy masala infused potato mash. The sandwiches at the roadside stalls are always vegetarian. They occasionally offer commercial brown bread. Never gluten free. I would sometimes have a toast sandwich after work before heading home. And then, when I stopped working full time, after yoga class at The Yoga Institute. For me it always had to be the toast sandwich in handheld toasters. 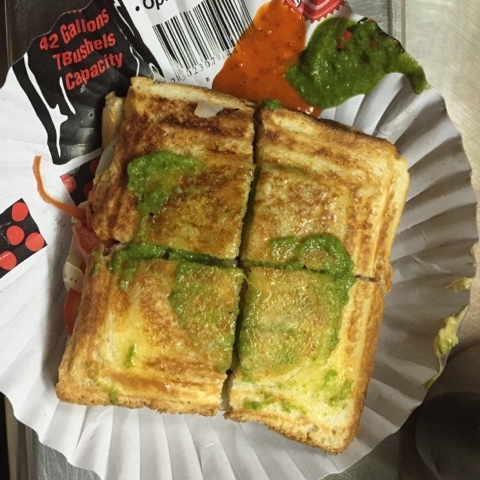 This is not the only version of the Mumbai sandwich that you get now though. A few years after I moved into Mumbai, I noticed that some sandwich-walas, especially in the suburbs, had begun to use portable electronic grills instead of handheld toasters to make the sandwiches. The handheld guys switched to small gas lit burners and the coal oven disappeared. From what I understand, the BMC doesn't approve of open fires and hence the coal ovens are gone. This is what I have hard from the sandwich guys so I can't verify this. Those with electric grills would make the sandwiches with larger slices of bread and use an excess of various vegetarian fillings with lots of cheese. These sandwiches are fully loaded. They have their fans and are quite popular though they cost more than the simple handheld toaster toasted sandwiches. I never took to the electronic griller grilled sandwiches and would always look for guys with handheld toasters. I will tell you why in a bit but let me first tell you what happened on Friday evening. I was hungry after yoga class. The Uber I booked was far away so I thought I would have a bite before the cab reached. I walked down the road that comes out of the Yoga Institute looking for food. There were vada pav guys but didn't seem like a good idea after yoga plus I had acidity the last time I had a bhajiya pav here. There were pani puri stalls which in the rain didn't make sense from a hygiene point of view, plus I don't even like pani puris. Then I reached the east entrance of the Santa Cruz station. Opposite that was a snack stall called Shiv Sai snacks. On sale were dabelis, frankies, pizzas and then I spotted sandwiches. The menu showed that sandwiches were Rs 60 and up. Way more expensive than the handheld guys whose stuff vary from Rs 15 to 30 odd depending on where you had it. Sandwiches in suburbs like Bandra are more expensive than in older South Mumbai. It's even more expensive when you add cheese. I was hungry so I placed an order for a sandwich at Shiv Sai. The person manning the stall wanted to know if I wanted a big or a small sandwich. I went through the menu and saw there were two sections. Grill sandwiches at Rs 60 up and toast sandwich at Rs 25 up. I realised that the grill sandwiches were the ones that used larger bread slices and were stuffed more. On the other hand, plain 'sandwich' (versus 'grill') used regular sized (not the massive ones) bread slices and handheld griller like, moderate quality of veggies. The toast got ready surprisingly soon. Faster than in a handheld toaster. When I commented on this, the person making the sandwich told me that sandwiches in electronic grills take less time than handheld grills. More so in the evening where they continuously make sandwiches and the grill remains hot. as Samkit pointed out on Twitter, the electric grills are possibly preferred as they can churn out more sandwiches and increase productivity. That's when it struck me. This was like cooking in a pre-heated oven. The result was a hot, spicy, nourishing sandwich with a resounding crunch, perfect on a wet evening. I liked it a lot even though it was made in a grill. It changed my point of view on sandwiches made in grillers. Later, while discussing the sandwich with pastry chef Kishi Arora on Twitter, I realised that I generally like the handheld toaster version more because of the regular sliced bread and stuffing which is not excessive unlike in the massive grill sandwich sandwiches. Using this formula (regular bread and not excessive veggies) in a grill worked for me this evening. Over stuffing and using massive slices of bread, on the other hand, kills half the joy for me. Kishi told me that her mother doesn't over stuff parathas because of this reason. This made sense as over stuffing makes the paratha unwieldily and it might break too. This is the reason why, on a separate note, I go for the sada dosa which doesn't have a stuffing over the masala dosa. Food choices are subjective of course. I would like to know how do you like to have your Bombay sandwich? Do you order the larger and more expensive ones made in electronic grills with cheese and with lots of stuffing in it or the regular sized ones which are made in handheld toasters. And do you prefer plain boiled slices of alu like I do which makes for vegetable sandwich? Or do you like the spice heavy, mashed potato filling, which is added to what is called the masala toast sandwich? Let me know which do you like and why? As Frasier said, 'I am listening'. Handheld toasties are much better but generally they use mashed potatoes in them so I specifically ask for the sliced veggies in them.